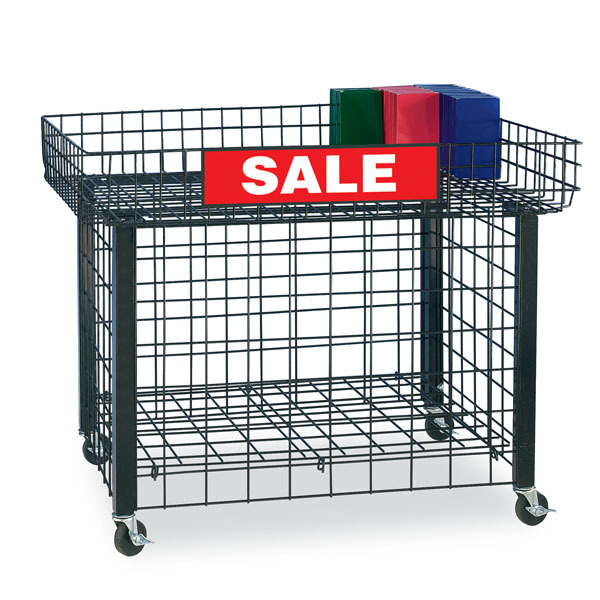 This Extra-sturdy Merchandising Table and Bin is easy to move with its heavy duty locking casters. Area below top can be accessed from sides to be used as extra storage. Table top is 6 in. D and is removable, so unit can also be used as a dump bin that features an adjustable bottom shelf that can be raised to accommodate smaller items. Some assembly required. Shown with optional sign holder, item 1201BK. 42 in. W x 30 in. D. x 30 in. H with 6 in. H table top bin.